New highs again for the SP 500, DOW, and NASDAQ as Tax reform talks continue with consumer strength showing up in Retail and Financials also doing well. Retail sales just reported the highest year over year growth since 2012. 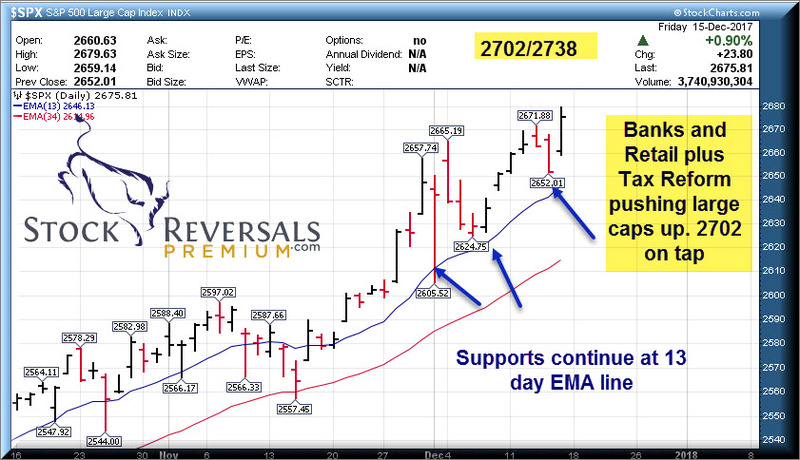 We have been targeting a 2702 pivot for the SP 500 with supports coming in nicely at the 13 day EMA line on the daily charts for the index. Its a typical year end rally which could lead to some corrective action in early January as investors postpone selling to defer taxable gains into 2019. 2702 and 2738 are the stretched pivots for the SP 500 rally going all the way back to the 1810 lows of January 2016, a near two year uptrend. We would again expect major resistance at those two levels regardless of Tax Reform outcomes or other news. 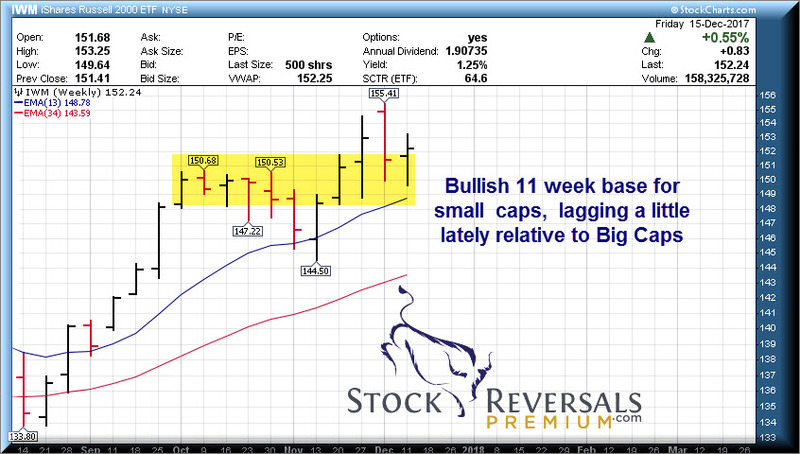 The Small Caps are building a nice 11 week overall base, lagging the large caps a bit over last few weeks. Expecting to see a lot of mergers and acquisitions in 2018 if the Corporate Tax rate drops to 20-21% from 35%. Stock buybacks, dividends boosts etc. all make the general market attractive even though we have had a huge rally. That said, all of this tends to get priced in, so bear that in mind. If not yet a Free Member of Stockreversals.com , opt in here with name and email to get timely reports and more and a 30% Coupon Code to try our SRP Swing Trade Service! BIOTECH: We can also see the XBI ETF (Biotech) has been in a 26 week base overall with a 8-9% swing roughly. No real traction in some time. Part of this due to drug pricing pressures and generics coming on the market as well. That said, market may be pricing some of this in during the consolidation and we could see a move up in the 1st quarter in this group. 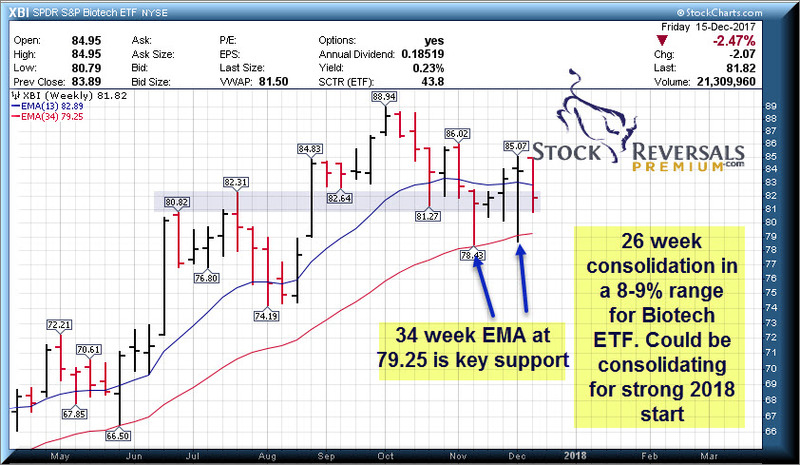 Keep an eye on the 34 week EMA line at 79.25. 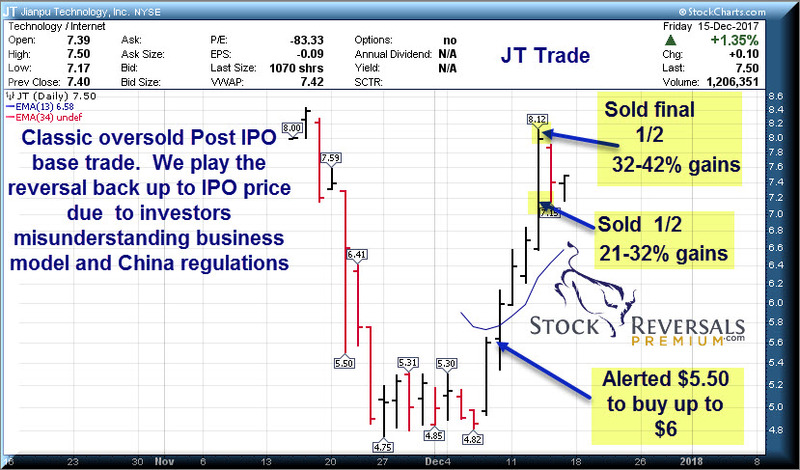 Swing Trading the POST IPO Base: JT 21-42% gain in days!! 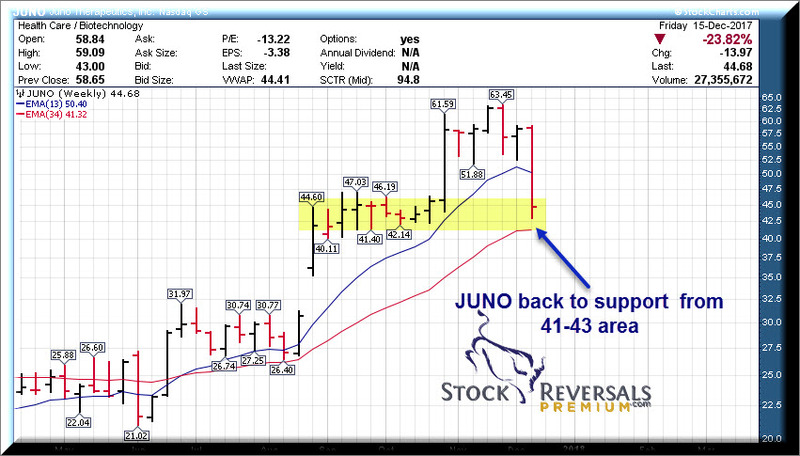 This past week we had a great run up in our JT swing trade play at SRP. This was a Chinese based company with a good pedigree. The IPO went off at $8 with strong underwriters. This IPO was bought into by insiders, and yet the stock was slammed on Chinese micro-loan regulation concerns. The thing is, they are a financial content aggregator and make their revenues based on referral fees when a credit card or loan application is completed. JT does not underwrite actual loans. A simple reading of the prospectus would have spelled that out. In addition, when we read the prospectus we found that insiders were taking a private placement of 40 million at the IPO price of $8, alongside the 180 million being raised. Given that their cost basis in the shares is very low Pre-IPO, this was a strong vote of confidence we thought. Once we reviewed the fundamentals, we decided the market had over reacted to the Chinese regulations. In addition, the 3rd quarter results were already published in the prospectus even though the actual results did not come out until this past week. Little hidden gems that most investors are not aware of , this gives us the edge at SRP. We profited with an over all 21-42% gain in a short window of time. Never ignore the fundamentals, share structure, or the details in an IPO prospectus, that’s the lesson. We continue to like the shares long term and see significant upside for patient investors. Each week we list out 10-18 names that we often drill down on and consider a few for SRP Swing Trade alerts. This past week JT was the big winner from last weeks list along with OSTK which ripped higher and is a TippingPointStock.com position from $44-$46 area (Now $68 plus). SOGO- Chinese Internet Search and Language input leader. Double bottom possible here, working with Wechat. YY- 5 week base pattern, this continues to set up nicely for a breakout. We have played this 3 times in the past 4-5 months at SRP for big gains. FND- Wide base pattern Post IPO, going on 6 months. Floor and Decor seeing strong consumer demand in stores. MRCY- 13 week base pattern, Secure sub systems for Defense and Intelligence applications. This past week hitting 21-42% gains on each 1/2 size of our JT Swing Trade!